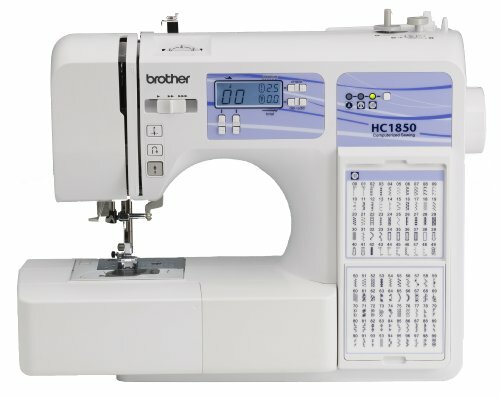 The Brother HC1850 is a popular and affordable sewing machine to serve a variety of sewing needs. From quilting to garment construction and more, this machine has the features necessary to complete all types of projects. Several included presser feet, a range of thoughtful features, and a durable construction make the HC1850 an attractive choice for sewers. Considering the affordable mid-range price of the HC1850, this versatile collection of stitches is remarkable. You can complete all of your projects with this single machine, whether you’re repairing a pair of pants or making a decorative quilt from scratch. With this large number of stitches, it could get tricky to select the one you want, but Brother has eliminated this issue with a built-in stitch flip-card and digital stitch selection. Just refer to the chart on the front of the machine to choose your desired stitch, then use the push-button stitch selectors. Your choice will be clearly displayed on the LCD screen. Bobbin winding can be a frustration-inducing process for some sewers. Fortunately, the HC1850 makes it easy with its automatic bobbin winder. After placing your thread, just move the bobbin to the right and press the “Start” button–before you know it, the bobbin will be wound and ready to go! A quick-set, drop-in bobbin compartment saves time as you’re setting up the machine. All you have to do is drop the bobbin in and lead the thread through the designated slot. If you’re tired of struggling to thread your needle each time you sit down to sew, this machine could be an awesome choice for you. The built-in automatic needle threader pushes the thread through the eye of your needle; all you have to do is press a lever. Not all sewers work at the same speed, and some projects can be sewn faster than others. Adjust your sewing speed as needed with the simple stitch speed slide control. This is also an excellent feature for beginner sewers who want to start off slowly. The Brother HC1850 provides a comfortable and efficient sewing workspace with a backlit LCD display screen, bright LED bulb, and expanded table space. This sewing machine is ideal for large projects like pants, dresses, curtains and quilts with its large detachable table. Simply add on this additional workspace to maneuver large sections of fabric with ease. Visibility is important when you’re sewing–you need to be able to see each small, detailed stitch. The HC1850 has an LED-lit work area for you to clearly see all of your work, no matter what the quality of the light in the room is. A phenomenal variety of accessories is included with the Brother HC1850, including several presser feet and a selection of sewing tools. 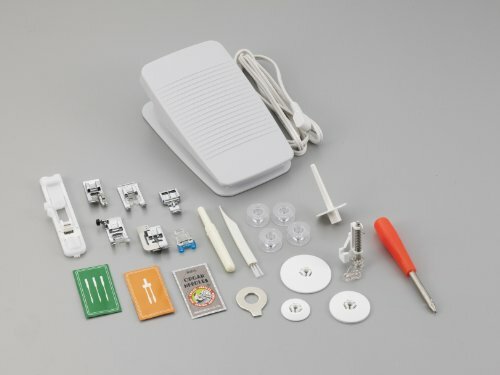 These handy extras will allow you to start sewing as soon as the machine arrives, and give you the means to complete a broader range of projects. The accessories listed above come in a convenient pouch for more organized storage. The HC1850 also comes with a foot controlled pedal. If sewing with the pedal isn’t for you, you can choose to detach the foot pedal and operate the machine manually with the stop/start button. The Brother HC1850 is surprisingly lightweight considering the breadth of features it includes. It weighs just over 13 pounds for portability and convenience. In addition to its lightweight construction, the HC1850 has a built-in carrying handle for easy transportation. 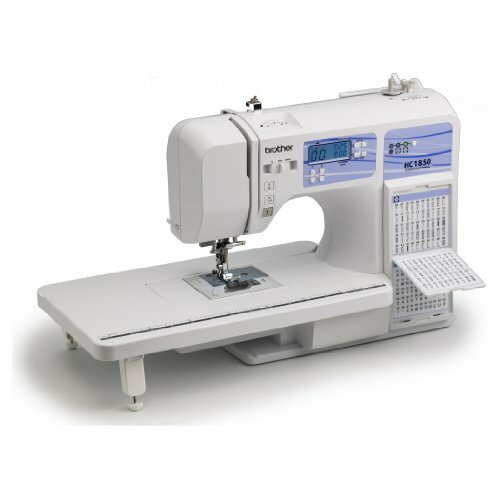 Bring this machine along to your sewing class or friend’s house, completely hassle-free. 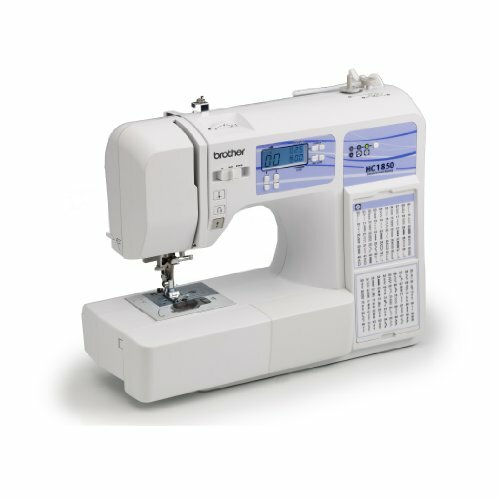 Brother is a credible name in the sewing industry, so you can trust this machine’s quality and durability. If any issues arise, it comes with a 25-year limited warranty, so your purchase is protected. The HC1850 is a well-rounded machine with several pros to consider; its main benefits are listed below. While this machine includes several features to complete advanced projects, it’s simple enough for beginners to use. Features like the adjustable sewing speed, automatic needle threader, and easy bobbin winder allow for complete ease of use. If you’re a quilter, this machine comes with many awesome features for you. In addition to the spring action quilting foot, wide table to accommodate quilting projects, and 14 quilting stitch options, it includes a drop feed feature for free-motion quilting. This machine is budget-friendly. It can complete a wide range of projects so you can use a single machine for all of your sewing projects. While this machine does include a reverse button, it only makes a truly reversed stitch for certain stitch options. For the more complex stitches, it only makes a small reinforcement stitch. The monogramming font is limited and only includes uppercase letters. The HC1850 is fairly loud when is use, especially when working through thick fabrics. The Brother HC1850 sewing machine is a fantastic choice for beginners and advanced sewers alike. Its sweeping selection of stitches, features, and accessories make the HC1850 a strong competitor among other mid-range sewing machines.